Heritage put together a great video that highlights the career of British Prime Minister Margaret Thatcher. It’s funny that we look for deeper meaning in little things, and often a source of humor when I see other pundits doing so. Don’t get me wrong: I love Tom Friedman, but can’t you see him opining on the deeper meaning of an ant crawling across his razor in the morning and why that perfectly symbolizes the schism between grand theories of technotopia and the teacherless chalkboards of (insert country name) schoolchildren … or whatever? So here I am, trying not to be Tom Friedman, but I can’t help it. He’s right. Analogies and metaphors help us make sense of the world. And isn’t that the technique we economists use also? We struggle to reconcile our mathematically abstract theoretical models with empirical reality. Why should we be so snotty that our models use greek symbols while Friedman’s models use narrative characters? How dare he use simple animals and objects that people can actually relate to and learn from! My son lost his iPhone. In the grand scheme of things, as I told him repeatedly last night, this rates as “Not A Big Deal.” But it is to him, now, at this moment. He had value on that phone, not in terms of its cost in dollars to replace, but in photos and more importantly his connection to life. We are social animals after all, and it is disorienting to lose our senses — sight, hearing, internet connection — no matter how briefly. Can you imagine me saying, “You’ll just be blind for a week or two, son. Not A Big Deal.”? The lost iPhone is a metaphor for the lost connection that economies suffer from constantly. We grow, literally, richer as we become more deeply connected. 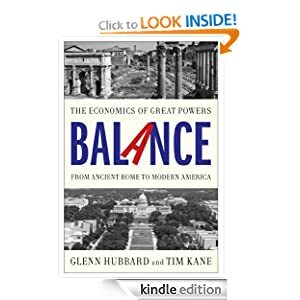 Glenn and I make this point in our template for growth/decline in BALANCE, a template which has been revealed by great civilizations of the last two thousand years. Openness is a fundamental component of GDP and productivity growth. Let’s unpack that for a moment. The collective GDP of a nation is enhanced by commercial expansion and by the specialization of labor that occurs. More importantly, individual incomes (which is almost perfectly related to GDP per capita) grow as labor specializes. In policy circles, there is a constant struggle to achieve more openness, especially when defined in terms of connecting the domestic economy to others. It is fought under the labels of “immigration” (which is a bipartisan muddle) and “free trade” (which Republicans favor far more than Democrats, but is also muddled (Clinton good / Obama absent (Dare I sub-parens again?))). As a sidenote, many on the Left mischaracterize the diversity of opinion about immigration on the Right. For those so inclined, let me point you to a recent CATO blog post about the difference of opinion among scholars at the conservative Heritage Foundation on immigration reform. One of the reports cited was co-authored by me when I was a scholar there half a decade ago. There are people who have figured this out, who’ve learned the perfect balance between silence and communication, who know when to sit quietly in a nook and read a novel, and when to work the phone, and when to sent out a blast email, and when to monitor Twitter feed and update Facebook, all while maintaining meaningful face-to-face relationships and setting aside time for hobbies and exercise and caregiving and home maintenance and all the other necessities of a civilized existence. My advice is this: build an economic wall around the United States and you almost guarantee the nation’s long term decline. The prosperity of our grandchildren depends on constant vigilance toward economic liberty. As for my son, my advice is this: enjoy the silence. The world is about to get loud.